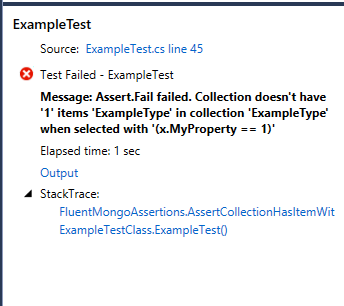 This is similar to my post around Azure Storage Integration testing just with a mongo twist. I’ve been working with mongo and didn’t really like the debugging workflow: Do something, start mongovue and manually check the item changed in the way you thought it would. I’ve written a set of extensions to allow a nice set of declarative fluent assertions about the state of the MongoDB after an action has been performed. Then I’ve also tweaked the extensions methods to give some nice actionable feedback when a test fails. For example when you create a query this is captured as an expression that is shown in the test output so you know exactly what query ran and can go about fixing it. The source is up on Github, here. Let me know how you get on!